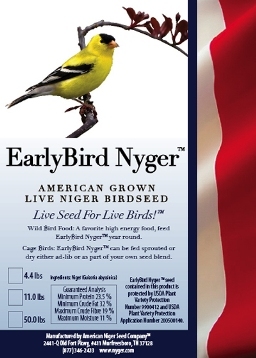 American Niger Seed Company™ now offers EarlyBird NigerTM seed through the Fabulous Finch Online Store! Just click on the Buy Now button and add the seed to your cart. Then checkout. For bee pasture and/or cover crop or for niger seed production. Can be used as fall bee pasture when seeded in small grain stubble as a second crop. An organic grower has been successful establishing alfalfa using niger as a companion crop. A licensing agreement is necessary together with purchase. Contact us for more information.